Most of us think that we don't need a body lotion in Summers. I used to do too, until I tried two light weight body lotions this summer: Soulflower Strawberry body milk that I have reviewed here and Nivea Whitening Cell repair and UV protect lotion (will review next summers). Only after you apply lotion in summers, do you realize how thirsty your skin actually is and that it does need proper moisturization in summers too (moisturization minus the oiliness). NOTE: Review updated 10 Dec 2013. 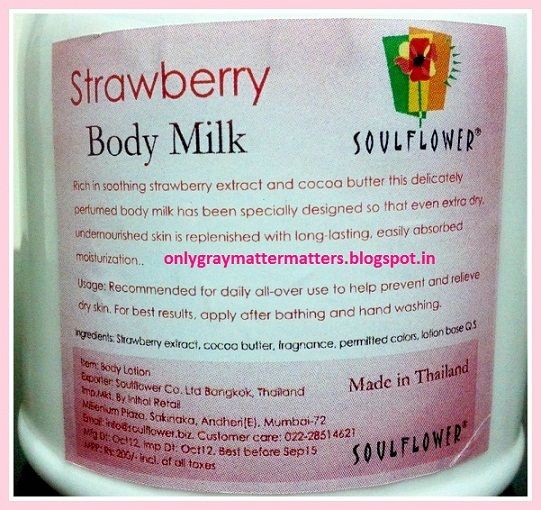 I discovered this body milk first on the Soulflower website. 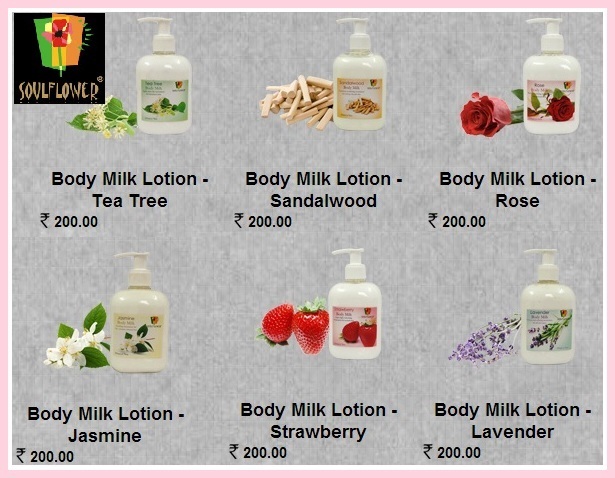 Soulflower Body Milks come in 6 variations, which all have their own properties. The reason I chose this flavor is because strawberries are rich in antioxidants. Availability: Easily available on most online stores that sell this brand. Ingredients: Strawberry extract, cocoa butter, Aloevera, fragrance, permitted colors, lotion base Q.S. Does NOT contain any preservatives, artificial humectants or chemicals. I confirmed with Soulflower team that the 'fragrance' mentioned in the ingredient list is NOT perfume but strawberry oil. It is white milk, so I don't see any colors added, but I don't know what has been used as a base for this lotion. When I first pumped out this strawberry body milk for the first time, it had a strong divine smell of freshly crushed strawberries. I have tasted fresh from the garden strawberries many times and know the exact flavor. However, after the first two days, it started smelling like a strong incense stick (agarbatti) and I checked with Soulflower about it. They said that the aroma is locked when the product is new (just like newly opened perfumes), and should tone down later. Also, they suggested shaking the bottle every time before using it. This body milk is very light weight and gets instantly absorbed into the skin, without a hint of stickiness or oiliness. However, you can use it only during certain months of the year: Mar to May and Oct to Nov. When used during these months, it made my elbows and knees super soft and my skin supple and glowing. Within 10 min of application, it absorbs deep into the skin with your natural body heat and skin feels silky smooth. The fragrance lasts almost the whole day and I get compliments from others as the aroma fills the room too. The remaining Summer months are hot and humid. I felt a certain burning /stingy feeling with this body milk during that time, just like how essential oils feel strong on the skin when not properly diluted. So it is not comfortable to be used during extreme hot and humid weather. This body milk does not contain synthetic ingredients like dimethicone or mineral oil, so it is not suitable to be used in winters too. Mineral oil or dimethicone form a barrier on the skin thus locking the moisture inside but this body milk cannot do that and hence it failed me in winters. The packing turned out bad because I could lock the pump but it never unlocked. So while struggling to unlock it, the pump broke and no other cap or pump fitted it. So I had to make a lot of effort to keep it covered and dust free. When I passed feedback to souflower, they mentioned that they have laready launched a new packing for these body milks and are trying to finish up the older bottles. TIP: Like I said, it did not work for me in winters. I did one last experiment with it a few days ago. I know that just like mineral oil, Avocado oil also forms a barrier on the skin and is a natural alternative to mineral oil. So I mixed the remaining lotion with avocado oil and applied and it worked like magic. So if any of you still have this lotion left and want to turn it into a winter lotion, simply add olive/Jojoba or avocado oil to it and use. Another important difference I noticed is, with other body lotions in the market, if you happen to rub your eyes or touch your tear duct after freshly applying the lotion, they burn like hell into your eyes. With this one, it didn't happen. 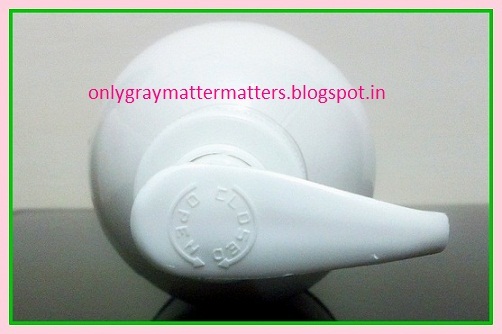 During summers, I even tried it on cracked heels and it helped repair them to a good extent. People who don't like sweet fruity fragrances may not like it. I have not repurchased it but may try another flavor next year. Works best during summer-end/winter-beginning when you need light weight moisturization. 1. Tea Tree: Contains Tea tree essential oil, cocoa butter, Aloevera, fragrance, lotion base Q.S. 2. Sandalwood: Contains Sandalwood extract, cocoa butter, Aloevera, fragrance, lotion base Q.S. 3. Rose: Contains Rose extract, cocoa butter, Aloevera, fragrance, lotion base Q.S. 4. Jasmine: Contains Jasmine extract, cocoa butter, Aloevera, fragrance, lotion base Q.S. 5. Lavender: Contains Lavender essential oil, cocoa butter, Aloevera, fragrance, lotion base Q.S. Thanks Supriya. Even Tea Tree would be good for the skin for summers. For lavender, you can also add some drops of lavender essential oil to your current favorite lotion to get that calming effect. Missed out couple of posts I guess during that time. Lovely review ! Kudos for your honesty ! !